Compared to a standard MP3, the HE version is likely to be half the size with all the quality. 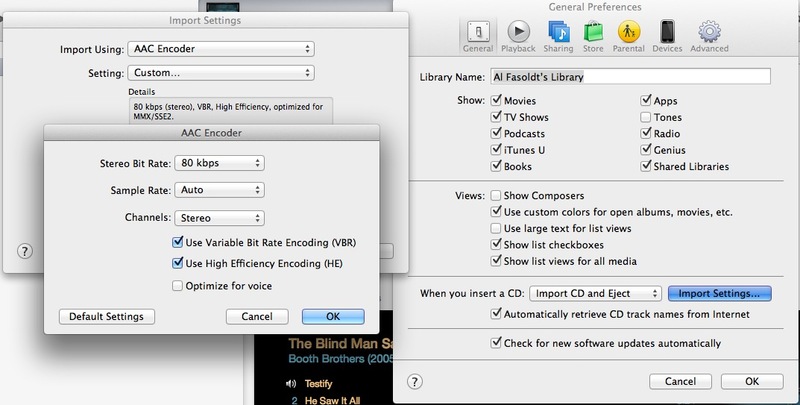 YOU CAN SEE from the iTunes Preferences where to make changes to rip your CDs using the high-efficiency encoder, called HE AAC. The results? Much smaller files and no sacrifice in sound quality. Like many of you, I've been ripping my CDs for years. I have thousands, and everything worked fine until my most recent problem. I'm running out of space. Don't tell me about cheap hard drives. I've got cheap hard drives. Lots of them. I'm still running out of space. But I've found a solution. I'll tell you about it in a few seconds. But stick with me while I let everybody else in on what we're talking about. Ripping sounds like something you do to all old rag. But it's just a term for getting the music off a CD as quickly as possible. Ripping pulls the digital audio files right off the CD and stores them as playable music on your computer. (You can do the same sort of ripping to get movies off DVDs, too.) Ripping is entirely legal as long as you don't sell the ripped versions. Why would you rip CDs in the first place? Two reasons: Music files such as MP3s are a zillion times easier to store, find, organize and play than CDs are -- no searching through shelves or boxes -- and they can be played anywhere, on a computer, portable music player, tablet or smartphone. A distinction here: When you rip a CD, you're not playing it. That would take too long. "Ripping" is an apt word, because the music is yanked off the disk at high speed, 10 to 20 times faster than playing speed. So ripping a CD only takes a few minutes in most cases. I'm mentioning this because you might find an option in your ripping software that lets you listen to the CD as it's being ripped. That's not a good idea if you have a lot of CDs to rip and don't want to spend weeks doing it. Now back to my solution to the storage problem. More or less by accident, while I was looking for a suitable way to digitize some old family voice recordings, I was reminded of High-Efficiency Advanced Audio Coding. HE AAC has been around for a decade and is widely used for streaming audio -- in satellite and HD radio especially. Current implementations of HE AAC -- the term is sometimes reversed to AAC HE, as if to confuse all of us -- are much better than past methods. In fact, this audio encoding method, at first used only for voice, has become a rival for MP3 and regular AAC for music that needs to be stored or streamed at a much smaller file size. How much smaller? Compared to a standard MP3, the HE version is likely to be half the size with all the quality. You might even notice, as I have, that HE ACC encoded music often sounds better than music encoded with standard methods; the HE design is able to maintain audio fidelity in situations that would trip up MP3 and regular AAC encoding. Where do you find HE AAC? Right in Apple's iTunes. It has HE AAC recording and playback encoding built in, in both the Mac and Windows versions. It's also in the Music app on iPads, for playback only. I'm told WinAmp also has it on the Windows side. I'm an iTunes fan, so I use the iTunes version. To switch from the iTunes default to the HE version, open the iTunes Preferences. In the "General Preferences" section, choose "Import Settings." In that window, choose "AAC Encoder" and "Custom." Another window will open. In that window, choose "80 kbps" for the Stereo Bit Rate, "Auto" for the Sample Rate and "Stereo" for the Channels. Put a checkmark in "Use Variable Bit Rate Encoding (VBR)" and, most importantly, "Use High Efficiency Encoding (HE)." Don't check "Optimize for voice" unless you are ripping a voice recording.